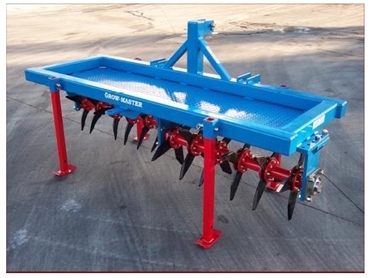 Grow-Master aerators from John Berends Implements have specially designed tines that increase the absorption of water and air by shattering the compact ground which encourages root growth. The twisted tines crack the ground in a sideway and downwards motion which enables nutrients, water and air to move through the soil. Grow-Master aerators come fitted with angled double rollers that reduce sideways drag when on the tractor. These rollers can be separately adjusted for various degrees of angles from 2.5 to a maximum of 10 degrees. When the offset position is at the most aggressive, the Grow-Master is best for cultivation and over-sowing new pasture seed. Grow-Masters come in four different working widths (2.0m, 2.4m, 2.8m, and 3.2m). A low horsepower of only 35HP is required for the 2.0m unit.